It's Christmas which means all sorts of fun for children. In the Jardin Bioves you'll find these large inflatable balls that float and move on water. This adorable child looks somewhat bemused. C'est Noël ce qui signifie toutes sortes de plaisirs pour les enfants. Dans le Jardin Biovès, on peut voir cet énorme ballon qui flotte et se déplace sur l'eau. Cette adorable enfant semble quelque peu étonnée. I would LOVE to try one of those...but am I too heavy? Superb shots, Jilly. This makes my claustrophobic hairs stand on end! Surreal - looks like an artist's fantasy. Jilly both photos are stupendous, almost surreal, I love them both. And just like bibi, I'd just LOVE to try one of those. Are adults allowed in? superbe cette idée des ballons, cela doit bien plaire aux enfants, et au grand cela rappellera la série "le prisonnier"
Something seems wrong with these. Have any been blown out to sea and the child lost? Seems as if that has happened recently. Such a shame. This gives magical pictures. Almost enchanting ! she looks like a snow angel. What a gorgeous photo. It looks like a watercolor painting. Your first shot is so beautyful!but the little lady seems to be a little scared or lost. I'm sure bigger people would enjoy it more!Like Olivier, I was thinking of "the prisonner" and his Rover! This is so unusual. I have never seen anything like it. 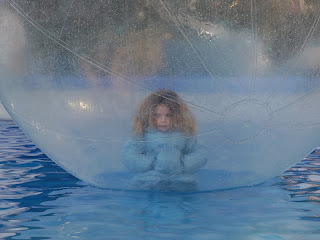 I wonder if all the children feel comfortable being enclosed like this. Love the top photo!!! Wonderful!!! I'd love to do this!!! They have something similar between "halves" at the LA Kings Hockey...though the bubbles aren't on water so adults can participate!!! This has a fantasy or surreal feel to it. It's a beautiful shot. This looks like you're channeling Renoir on acid. Gorgeous. 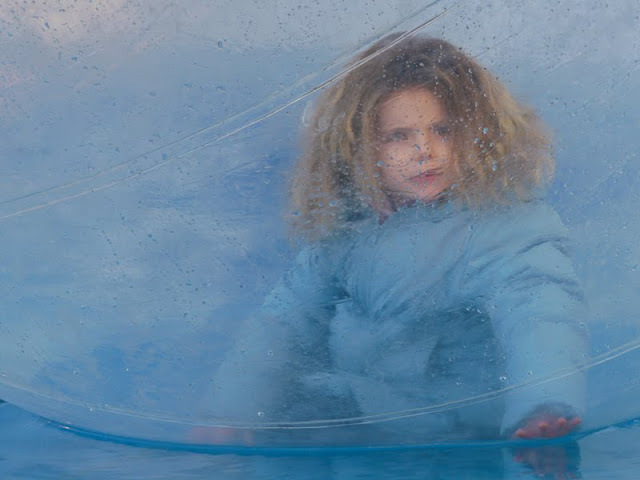 Amazing portraits of this child in the bubble... The top one looks like an oil painting... precious child. These are magical Jilly. Wonderful captures. THe concept is a bit eerie but your photos make it appear as a delightful experience. A somewhat disconcerting image even though the girl seems quite complacent. =) these photos are magical!